Wednesday was a very unusual day at Loch Lomond Elementary School. In the morning before the first bell rang, the phones in the office were going crazy! Mrs. Werle was running around trying to answer all the phone calls. She gasped because there were 83 phone calls she needed to answer! Mrs. Werle did not know what to do. 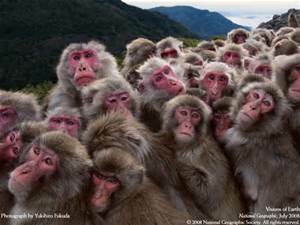 Suddenly, Bus 427 arrived at the front of the school and a large group of monkeys jumped off the bus. They raced into the office and started screaming, “OO, OO, AH, AH” as they answered all the phone calls. Mrs. Werle was surprised and happy because they fixed the problem. All of the phones had stopped ringing. Mrs. Werle gave bananas to all the monkeys and then collapsed into her chair. Mrs. Scotto’s class was playing bean bag toss in the gym. The four teams started the game. One of the girls accidentally threw it too high and the bean bag landed on the window ledge. Soon everyone started throwing the bean bags all over the gym. Some landed on the top of the clock. Others landed on the basketball hoop and the tubes on the ceiling. The monkeys raced, tumbled and screeched into the gym. They made a monkey tower that reached the ceiling. Then they started swinging from the pipes and they got all the bean bags. Mr. C was so happy! Meanwhile, something weird was happening in Room 209. When Mrs. Wright’s class started math the Promethean board turned into the kindergarten theme. Then none of the computers would let the students do their AR tests. Suddenly, the class heard a soft, “He, he, he.” They knew the elves had messed with all the classroom’s technology. Spontaneously the monkeys jumped in through the windows. They pushed and shoved their way into Room 209. The monkeys chased the elves out of their hiding places. They caught the elves with a net and launched them out of the windows. Then the monkeys fixed the computers and the Promethean board. The monkeys were tired after helping at Loch Lomond so they grabbed the pillows and beanbag chairs in Room 209. Then they fell asleep until the school bus came at the end of the day. This entry was posted in 2015/16 School Year, Mrs. Wright's Class. Bookmark the permalink. OO AH AH OO AH AH perfect for homework! I like this story. It was great. It would be great for homework. That was a good story. I love it. I liked the part when the monkeys threw the elves out the window. As I read this I thought maybe I can make this story and kind copy it and fix it up a little.